A self-described reporter who was taken down to the ground by police during a parade in Annandale has been found guilty of disorderly conduct and ordered to pay a $500 fine. The cell phone video of the police take down and arrest has been viewed thousands of times. The suspect in the video, Mike Stark, was working for the political organization ShareBlue Media when he approached Republican gubernatorial candidate Ed Gillespie's bus during a family-friendly parade. When police confronted Stark, the self-described reporter escalated the situation, a judge decided in court Tuesday. Stark escaped a second charge when Fairfax County District Judge Mark Simmons found him not guilty of resisting arrest. The cellphone video taken on Oct. 28 along a parade route was captured by one of Stark's ShareBlue colleagues. The ShareBlue Media mission statement says "we produce practical political content to delegitimize Trumps presidency." Stark testified his subject was Gillespie, who was scheduled to appear at the annual Annandale parade. Stark's own cellphone video, introduced at trial, shows him walking up to driver's side window of the Gillespie recreational vehicle before the parade begins. He confronted the driver about Gillespie saying things including, "it's a shame his policies such so bad he can't come out and shake hands." The Fairfax County police lieutenant overseeing the parade testified he noticed Stark right away lingering around the Gillespie bus, looking through the windows. Lt. Peter Massoro says the Gillespie campaign had expressed concerns about a man they feared could be violent hanging around the bus. Massoro said Stark stepped in front of the Gillespie RV as it was set to start rolling into the parade. Mossoro ordered Stark to get off the street. "He said, "[expletive] this. I'm a [expletive] reporter. You can't tell me what to do," Mossoro testified. "I was taken aback." Stark moved to the curb but wound up in the driveway where other parade units were lined up. "I immediately went back after him and told him to get back on the sidewalk," said Massoro. He said Stark used more profanity. With children nearby watching the parade, the officer issued a warning. "If you swear one more time I will arrest you," he said. Stark responded with more profanity. "My commander said, 'lock him up, Peter,' so I did." 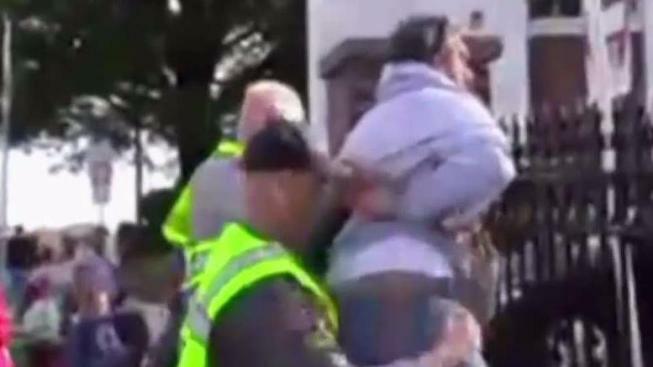 In the video Massoro and another officer grab Stark and push him against a iron fence, attempting to handcuff him. "He pushed back so I elected to remove his leg out from under him," said Massoro, describing the "ankle pick" he used to take Stark to the ground. "It was quite a spectacle in front of all those families and church people," Massoro said. After Stark fell to the ground, the video shows more officers piling on top of him. Parade organizer Carol Reuss said she also noticed Stark before the arrest & scolded him for his bad language. "Every time I turn around there is this guy right in the way," Reuss said. Stark argued he was the victim of an unlawful arrest. In a police cruiser video also introduced as evidence, Stark shares his thoughts with the officer driving him to the jail. "You immediately feel guilty when you are in handcuffs but I didn't do anything wrong today, not that warranted this," he said in the video. Stark testified he complied with the officer's requests to move from the street and onto the sidewalk. After the police take down, prosecutors argued Stark resisted arrest moving his arms away from officers trying to handcuff. Stark said he was only trying to protect his phone and the evidence it might contain. Judge Simmons agreed in part, ruling what happened didn't meet the legal definition of resisting arrest. But he found Stark guilty of disorderly conduct. He was sentenced to pay a $500 fine. The judge also had some stern words for Stark. Simmons said he's a former reporter himself and said he never would have asked the kinds of questions Stark was posing to the bus driver. He told Stark that he was the one who upped the ante. "The officer gave you a lot of breaks when he gave you a chance to move to the sidewalk," Simmons said. Simmons said when Stark kept confronting the officer, he ceased being a reporter. "You wanted to be an actor in the drama," he said. "You're elevating this." Stark said he's disappointed with the judge's ruling and is considering an appeal.